When I hear the Rainbow Lorikeets squabbling even louder than usual outside my kitchen window I know the Blue Quandong (Elaeocarpus grandis, aka Elaeocarpus angustifolius) is in flower. And what flowers they are – great masses of bell-shaped white blossom, each fringed at the bottom like a lampshade, or the dress of a tiny ballerina. 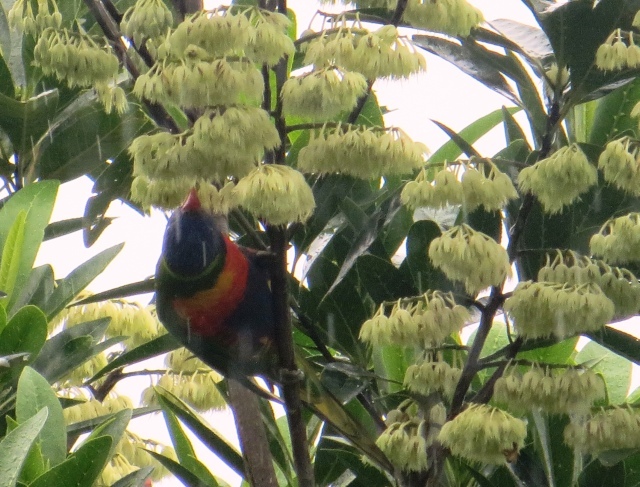 They don’t always come out every year so when they do we take a particular delight in them, just like the lorikeets and other nectar-feeders. This year the flowering is particularly abundant and though it’s easy to attribute this to a good wet season we’ve had similar prolonged drenching in other summers and yet the Blue Quandong doesn’t reward us with flowers. After the flowers come the fruits and in a good fruiting year theses, too, are a spectacle. Large, round and of a blue so bright and clear it’s impossible to compare it with anything else in nature, the fruits litter the ground and provide a feast for all sorts of creatures – rodents and ground-dwelling birds. Pigeons love them too, and take them before they drop. 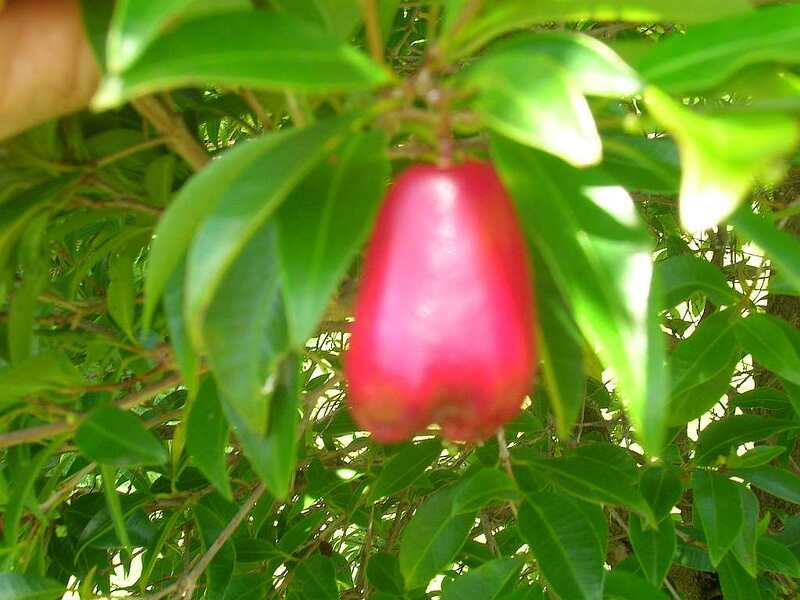 The fruits have little taste because the flesh is thin; nonetheless they were a popular food with Australian Aborigines back in the day, and it is from them we get the name “quandong”. Pioneers of European stock sometimes used them to make jam and pies, when times were desperate. This tree has a further aesthetic gift to offer; the long, serrate leaves turn a bright red when ready to drop and have a varnished look. This happens mainly in late winter and spring, coinciding with fruiting, and the sight of the bright red leaves and vivid blue fruit is quite something. Blue Quandong grows into too large a tree for the average home garden because it throws out very long, spreading branches. It’s a handsome tree, though, and worth growing if you have the room. If not, try one of the several smaller-growing elaeocarpuses such as E.foveolatus, E. ferruginiflorus, E. holopetalus, E. eumundii or the darling little Blueberry Ash ( E. reticulatus). All have their slightly different attractions. This is one of the easiest plants to grow from seed because the large kernels germinate fast and easily. Growth rate continues to be rapid and the tree can reach a good size within ten years. Position: Anywhere in the garden, but well away from any infrastructure as roots are invasive and the long, long branches are a nuisance if allowed to overhang gutters. Leaf and fruit drop should also be considered – don’t plant too close to a driveway. Watering: This is a tree from high rainfall areas but it will take at least 90 days without any rain or artificial watering once established with its roots down into the water table. Water well in the first couple of years after planting. Feeding: Not really necessary but you can add any kind of balanced fertilizer at seedling and sapling stage to increase growth. Pruning: YES! 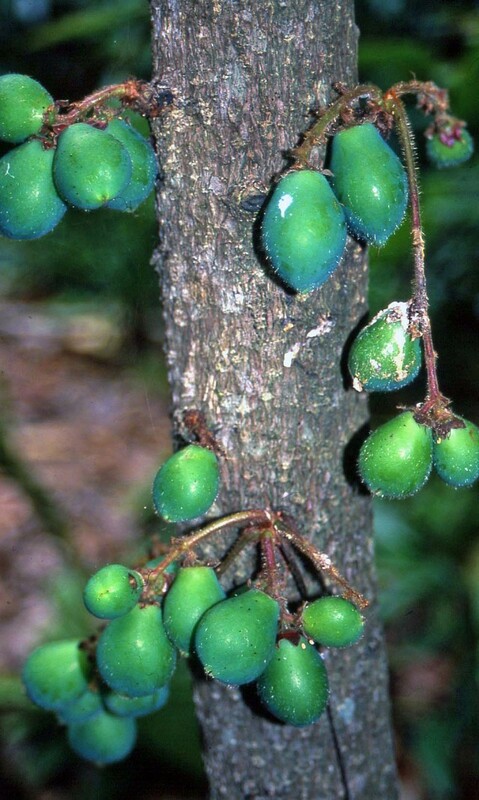 Blue Quandong tends to develop its side branches in layers out from the main stem; internodes are long and leaves born at the end of the branches, with an upright growth habit. Prune regularly when young, just cutting back the growing tips of the top and side branches about twice a year to promote a more compact, dense and bushy form. Flowering (and thus fruiting) may not occur until the tree is at least seven years old, sometimes not until 10 years old. Propagation: As stated, fast and reliable. Some people have good success by just taking the fruits and planting them in a growing mix. I usually wash them first to remove any grubs, then peel away the flesh and crack the kernel within, to speed things up. Expect germination from 4 – 8 weeks. Other Elaeocarpus species are much slower to propagate. You can also propagate from ripe top-of-the-stem cuttings. Australian rainforest food plants are useful additions to home gardens anywhere in the world where the winters aren’t cold enough for snow or too low in rainfall. They do best in tropical and sub-tropical climates but most will do surprisingly well in warm-temperate climates if given shelter from cold winds and hard frosts, and plenty of water during dry periods. Other than that, they are pretty tough plants that don’t need a lot of fussing. And they do add some interesting flavors to your home-grown diet. 1. Human health – though the nutritional values of most of Australia’s edible plants are still little appreciated or understood, they undoubtedly possess not only recognised vitamins but also unique values that benefit health in this climate. 3. Habitat restoration – if you live in Australia native food plants extend the natural vegetation linkages that are so vital to the sustainability of both plantlife and wildlife – how wonderful it would be to create a network of gardens and parks across the country enriched by plants that can feed both wildlife and humans! 4. Good looks – the rainforest species mentioned in this article are all attractive, garden-friendly plants that can be put to a variety of landscape uses – as single ornamentals, in shrubberies and buffer zones, as hedges, pot plants, street trees and feature plants in courtyards. You don’t actually need to give these plants any care after establishment; they’ll survive and even thrive. But if you’re growing them for food, a bit of extra TLC will give you more and better fruit. General cultivation tips: Improve soil at the planting site with compost; provide water in summer dry periods, fertilise young trees for improved yield (but never too much because too much nitrogen can promote foliage growth over fruit production); prune to maintain manageable shape and size; control fruit fly (in the two plums), protect from weather extremes. As many soils are deficient in calcium, it may help to add gypsum. Spring is the best time to fertilise and a high potassium fertiliser will improve fruit development in nut and fruit trees. The best of the two subspecies being cultivated, because it produces the largest and nicest fruit, is Davidsonia puriens var. puriens (the other is Davidsonia puriens var. jerseyana). This tree occurs naturally in northern New South Wales and tropical/sub-tropical Queensland. It’s quite small – to about 8m – with attractive toothed foliage and colourful new growth. Fruits can be as large as 6cm in diameter and are purplish black with reddish flesh. Very juicy but not very palatable because rather sour, so best if stewed with lots of sugar or honey. A dash of port or brandy does wonders to the flavour! The plum makes excellent jam and wine, and is a useful extender in other fruit jams. Fruit is produced mostly in summer (though sometimes both earlier and later) and in mature trees is very prolific. Improved yield cultivars are now available. Propagation: Fresh seed germinates easily. Early growth is slow. This ornamental lilly pilly bears lots of small, pear-shaped, pinkish-red fruits in summer. It’s a big tree to 30 m and can be widespreading too, so needs lots of room. It’s also fast-growing – the more water it has the faster it grows! It bears at an early age compared with most rainforest trees – about five years depending on conditions. When mature it’s very prolific. The crisp, tart fruit is edible though not exciting. It makes a very good juice when boiled with a sugar syrup and also jam, sauce (like cranberry sauce) and chutney, either alone or with other fruit (choco and riberry chutney is good!). I add it to fruit salads, or any type of salad, and use in a variety of dishes – curries, stir-fries, as a garnish. Also with apple and other fruit in pies. Cultivation: Using cutting-grown stock and pruning regularly means you can keep this to a manageable shrub size – it makes an excellent hedge but DOES need frequent trimming. It’s not fussy about soil and will take temperatures down to zero – and can even recover from frost, though protection when young is advisable. Plant in sun or shade, though full sun means more and better fruit. Improved (composted) soil will mean better fruit production and water retention, and maintaining an acidity level of around 5.6pH will assist nutrient take-up if you are fertilising your plants. Mulch well. I’ve found that good drainage is essential for healthy riberries and at the same time they like a lot of water (but not waterlogging). They’re geared naturally to withstand dry periods in winter/spring but growth will slow or stop if this happens during summer – so water may need to be applied. Fertilise with a low-phosphorus formula in spring, when the temperature begins to rise and rainfall begins. This is only necessary in the first couple of years to encourage growth. I just use compost and it seems to work well. Some commercial producers fertilise again in autumn. Prune young plants to encourage a multi-stemmed growth (up to 4); then again lightly each year after fruiting (more if it’s a hedge but remember heavy pruning will prevent a good fruit crop next time because fruit develops on each year’s mature growth). If the tree grows too large, it will need a good cut back every few years, and this will be followed by reduced fruit production for the next few seasons. If you’re planting a hedge, seedlings should be about 2m apart – if planting an avenue of individual trees/shrubs space about 5m apart – depending on desired size at maturity. Don’t plant too near drains, swimming pools or any buildings. The worst problem is a borer that gets into the ripening fruit. I don’t know a sustainable remedy for this – I’d try standard non-chemical remedies as for other fruit. Monitoring is crucial, and fruit should be picked immediately it ripens. Scale and sooty mould can also be a problem – natural oil remedies are the best remedy. Improved varieties – for size, flavor and seed reduction – are available. Fruit stores quite well and can be frozen. Fresh seed propagates quite easily but cutting-grown improved varieties are best. A wonderful plant; every garden should have one because it’s beautiful, easy to grow, useful and versatile. The leaves are the richest source of cineole in the world and useful as a biocide, should you want to go to the trouble of extracting the oil. It has a real “lemonade” flavour that’s not as harsh as other lemon-flavoured plants and is particularly suited to Asian dishes. It’s also easier to grow, better-suited to predominantly warm and wet climates and not so prone to insect attack as lemon verbena or lemon balm. (But try growing your lemon myrtles with a lemon balm groundcover for a REAL lemony experience!) Some claim that planting this small tree in and especially around a food/herb garden keeps certain pests at bay – even if this is not valid, lemon myrtle makes an excellent ornamental herbal hedge plant if kept trimmed low and bushy. Use for anything in which you need a lemon flavor – it makes good lemonade if leaves are boiled with sugar and water; can be used for lemon-flavoured oil or vinegar; makes a delightfully fragrant tea and is perfect with fish – or in a gin and tonic! The leaf dries well. Cultivation: No need to do much except perhaps provide water during very long dry periods in summer. Tip prune regularly and trim lightly once a year in autumn to maintain a manageable shape and height – keep it as a shrub rather than a tree. Protect young plants from wind. Grow in shade or full sun; sunlight develops the leaf flavour. This is a decorative landscaping plant for feature shrub/tree, border planting, hedge, tub or courtyard. This striking tree is a member of an ancient family of conifers that take us back to Gondwana. Though slender when young, it can grow pretty tall and wide. 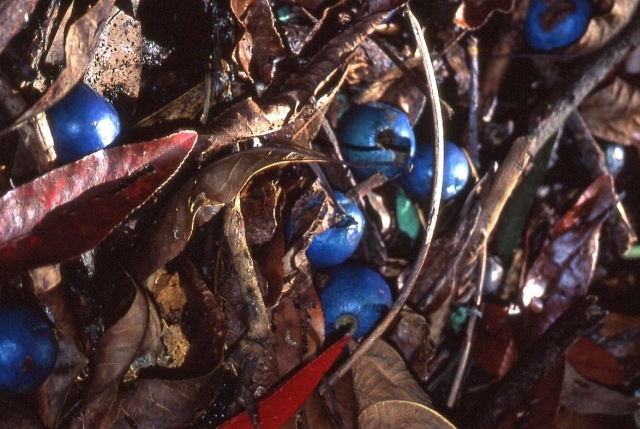 In autumn and winter female trees produce a blue-black fruit to about 30mm diameter with the seed carried on the outside of the flesh at the opposite end to the stem. The fruit can be stewed like Davidson’s Plum, or used with other fruits to make jam, chutney and sauces. It tolerates most local soil conditions including alkaline (though it occurs naturally on acid soils), and is also tolerant of light frosts. Cultivation: As for Davidsonia but again don’t overdose with high nitrogen fertiliser after the first year or two (when you need to encourage growth). Apply in early summer, rather than spring. This tree is a bit slow to start but gets away after the first 2 – 3 years. It needs plenty of water during establishment and again during long, dry periods in summer. As always, prune lightly after fruiting and tip prune after that to promote bushiness and keep size small. This is a tough plant that can be used for buffer plantings and is also a good timber tree. You need to have at least one male plus a couple of female trees for pollination and fruit production. Best to look for plants from good nurseries that clone their superior selections. Finger limes grow as small, shrubby trees in Queensland coastal ranges and lowand forests. In summer and autumn (usually) they bear finger-shaped fruit up to 10cm long, with thin green or yellow skin and green-yellow pulp. A subspecies with pink to red-flesh and red to purple or even black skin (Citrus australasica var. sanguinea) also exists but is becoming very rare. The grafted cultivar “Rainforest Pink Pearl”, now popular in cultivation, is bred from this – and is probably the best bet for home gardens because those from the wild take too long to bear – anything from 5 to 17 years! The fruits make excellent marmalade, drinks and tangy sauces, and can be used alone or with other fruits including as an extender with exotic citrus. They are delicious if pickled whole in brandy or any other liquor, like cumquats. The Round Lime occurs on the margins of rainforests and tolerates drier conditions. Its fruit is round and looks rather like a small exotic lime, with a thick green-to-yellow skin and pale green pulp. Australian native limes are hardy trees and rather slow growing, especially at first – but well worth the effort because they are both tasty and ornamental. Cultivation: Like all citrus they bear best if given water, especially in dry periods. A formulated citrus fertiliser seems to work well, applied in spring. Or just use a rich compost with plenty of potash added, for fruit development. Prune lightly in winter to open up trees and maintain height to no more than 4m. This tree bears a really tasty nut rather like a macadamia. It’s oval and bright red on the outside, containing an almond-sized kernel. Tree height is about 8m and can be kept smaller by light pruning; or made to develop several trunks if pruned when young (as with riberry). Seed germinates easily but seedlings need quite a bit of care so buying plants from a rainforest nursery is the easier option. Plant in spring/summer only and give protection from wind. Cultivation: As for Davidsonia and macadamias. At last, my new herb book is available for sale as a Kindle e-reader download from Amazon http://www.amazon.com/dp/B008R9JIUE. Cost is only $4.95 and it may well be the best five bucks you’ve spent in a long time! 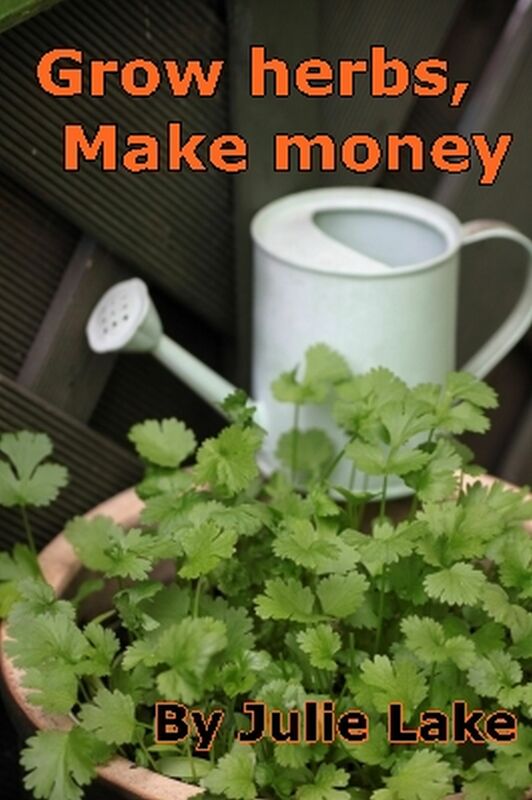 The book is called Grow Herbs – Make Money and shows you how to turn herb-growing from a hobby to a small backyard business, following the GardenEzi Five Step program. Growing herbs has been a major part of my life for 40 years or so now and yes, for some of those years I’ve made a dollar or two out of them but mostly I’ve grown them just for my own pleasure. There is something essentially satisfying about growing herbs. Humans and those plants we have chosen to designate as having culinary and/or medicinal value have an ancient association and I think those who still get pleasure from planting and harvesting our crops of parsley, sage, rosemary and thyme like to feel a continuing part of this tradition. Also, growing herbs is easy. Vegetables and fruit demand a lot from the gardener whereas herbs are cheap to buy, either from seed or in pots, and need very little attention. I have refined my herb-growing practices over the years so that today I grow only the chosen few. When I first started I tried growing just about anything that could be classified as a “herb” so that at one point my herb garden boasted about 45 different types of plant. I was an avid collector; joining a herb society, sending away for new and exotic species or varieties, and raiding the gardens of others with my knife and scissors. I read madly, built up a herb book library, concocted exciting new recipes, tried my hand at drying and otherwise preserving leaves and flowers, harvested seed in season, dosed my family with hideous concoctions. Indeed, my medicinal compounds rivalled those of Lily the Pink and though we all survived I soon lost interest – and faith – in the efficacy of such potions when compared with modern drugs manufactured by those with better knowledge, methods and equipment than I possessed! (Though I still think a cup of chamomile tea is soothing to the nerves and that mint tea aids digestion). My interest in culinary herbs, however, has endured. After all, I love to cook and so a source of fresh herbs is essential to me. And though I no longer believe in herbal remedies to cure disease I do (as a horticulturist and scientist) believe in the benefits of herbs in promoting good health. Like most plants, they contain their share of vitamins and minerals as well as the free-radicals and anti-oxidants that so many of today’s health gurus tell us are essential for our wellbeing. For me, though, it’s their taste that really matters. What are Italian tomato-based recipes without basil? Or salmon without dill? Or lamb without rosemary? Or just about anything without parsley? During the many years in which I’ve grown herbs I’ve had a variety of gardens, from large acreage to a courtyard. Today I have a very small area of garden around the house under cultivation and this gives me just enough room to grow the dozen herbs I consider essential for my kitchen. This include the Top Ten mentioned in my book – parsley, sage, rosemary, thyme, oregano, basil, dill, mint, coriander (cilantro) and chives – plus fennel and so-called Vietnamese mint. Where I live, fennel is a substitute for dill in the hot season, while Vietnamese mint is a suitable taste substitute for coriander. I also, some years, grow chervil as a cool season extra. While some of my larger or mat-forming herbs (fennel, oregano) are grown in-ground most are kept in pots. This enables me to move them around as necessary to take advantage (depending on time of year) of sun or shade. These days I grow from seed rather than from cuttings, using mostly commercial seed because it is easy and has good, reliable variability. Harvesting and storing your own seed is quite hard work and the viability rate is a lot lower – I’ve been there and done that and now I have other interests that consume my time so my herb-growing can’t be allowed to take up more than, say, one hour a week. Yup, that’s all it takes me nowadays to keep my kitchen well-supplied and help out a few friends as well. I do think that one of the handy things about learning to be a good herb-grower is that it IS one of those hobbies that can make a profit. It’s not difficult at all to expand your own growing program to produce pots and fresh herbs for sale. And from that small step it’s possible to build up that program to a small backyard business that won’t make a fortune but WILL bring in some extra income for relatively little effort after the setting-up process. That’s why I wrote Grow Herbs – Make Money, to show how this could be done. It’s not for everyone, but for those looking for some extra money growing herbs is not a bad way of getting it. I love my herbs! Indeed, they have been one of the enduring loves of my life and have never let me down. If I lived in a tiny flat with a window box I’d still grow a small selection of them. The smell, the feel and the taste of them enchants my daily life – if you’ve never tried growing them yourself, please give it a go. You’ll find herb-growing good therapy as well as good fun!